We are proud to introduce the Grace Mainvil Scholarship in memory of our beloved past treasurer who passed away in 2017. This scholarship is open to those who are in their last year of eligibility of Udaleku (ie: will be 16 years of age before the September following Udaleku). The winner of the scholarship will have their Udaleku tuition reimbursed by the scholarship fund and their entry will be featured on the N.A.B.O. website. By submitting an entry for the scholarship you are hereby agreeing to allow N.A.B.O. to publish that submission on the N.A.B.O. website, use it in written promotional material, and allow for replication by 3rd party sites with N.A.B.O. approval. Please email the submissions to udaleku@nabasque.eus. The submission deadline is April 15th. Blind submissions will read by a panel of judges who will use this rubric in their scoring. The winner will be announced on the first Thursday in May. 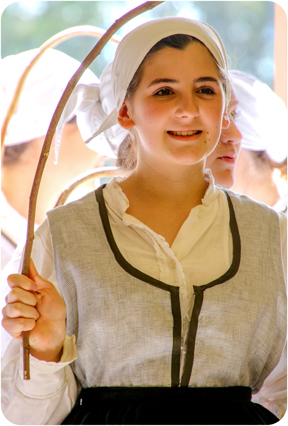 Giselle Moulia - Member of the San Francisco Basque Cultural Center. Giselle (Gigi) is now getting ready for her fifth Udaleku experience in Reno, NV July 8-20th, 2018. The scholarship application requires an essay in two parts: a) what impact Udaleku has had on you and b) what advice would you give to a new Udaleku camper? In Gigi’s response, she stressed the importance of meeting new people at camp, not only among the campers, but also the experiences she has had with various host families she’s stayed with. She credits Udaleku too with her increased knowledge of the Basque culture that now enables her to better respond to the question, “What’s Basque?” When asked for advice for new campers she said, “The biggest piece of advice I could give to a new camper is to push yourself to step out of your comfort zone, whether that be trying a new sport or meeting new people. This is a key part of Udaleku…” Well said Gigi, and Zorionak!